Place one oven rack in upper one-third of oven and second rack in bottom one-third of oven. Heat oven to 400°F. Spray two 15x10x1-inch pans with cooking spray. In medium bowl, add potatoes, 1 tablespoon of the olive oil, 1 teaspoon of the salt and 1/4 teaspoon of the pepper, tossing to combine. 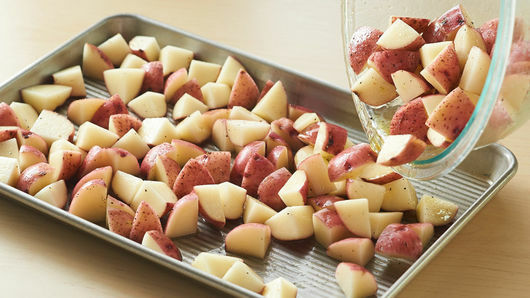 Place in one of the pans, potatoes cut side down. Roast potatoes on top oven rack 20 minutes; stir. 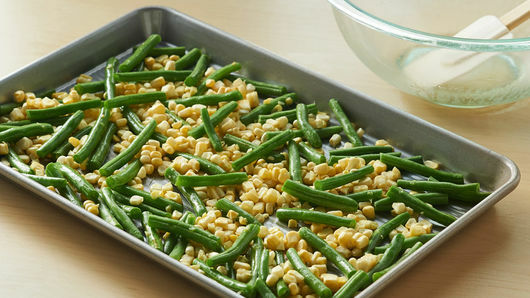 Meanwhile, in same bowl, add 1 tablespoon of the olive oil, the corn and green beans; spread out on remaining pan, and place on lower oven rack. 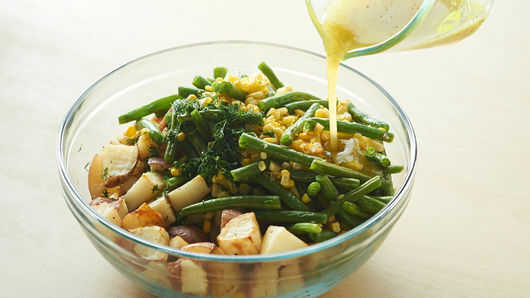 Roast corn mixture and potatoes 20 to 23 minutes or until potatoes are browned and tender when poked with fork, and green beans are slightly shriveled. Cool roasted vegetables 10 minutes, and transfer to large bowl. In small bowl, beat remaining 1/4 cup olive oil, the white wine vinegar, remaining 1/4 teaspoon salt and 1/4 teaspoon pepper with whisk until combined. Stir in chopped dill. Add to vegetables, tossing to combine. Add green onions and cherry tomatoes; stir. Serve immediately, or refrigerate until serving. 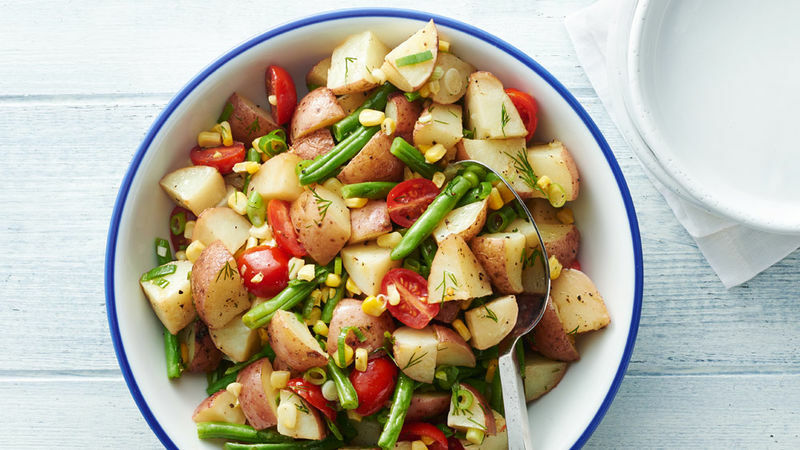 Stir in 1/2 cup chopped cooked bacon to add great flavor to this roasted vegetable potato salad. If substituting frozen corn, be sure to thaw first.